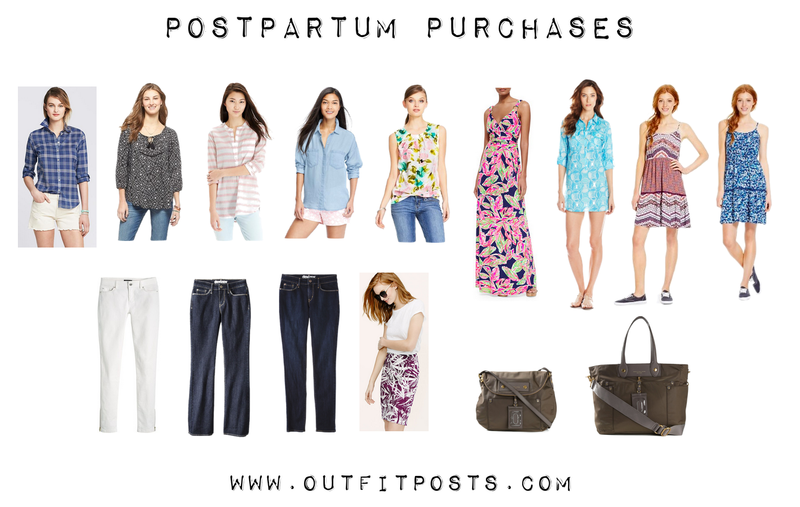 While I’ve been complaining a lot about feeling like I have nothing to wear – looking at my ‘fits me postpartum’ section of my closet – I’ve actually made quite a few purchases over the past 3.5 months. I decided to round them all up and share them with you guys. Putting them all together in a graphic shows me that while I have done some shopping for stuff to fit me at my current size – it’s been mostly for very casual clothing. Which makes sense because for the first three months after baby I was home getting barfed on and not headed into an office. I have a bunch of maternity tops that I wore while I was pregnant and they had great details like ties & ruching for showing off the bump. But postpartum, I still have a 4 month bump and no longer want to emphasize it. So I’ve slowly been picking up a series of tops that have leeway around the midsection. About a month in the full belly coverage maternity pants all started moving around on me because I was no longer pregnant. But my ‘normal’ sized jeans are still just a tiny dream to being worn. So I bought three pairs of pants at Target to hold me over during this middle sized phase. Found a boho trapeze shaped dress at Target and bought it in an XL. I basically started living in it because I love it so much. So I went online and bought it in blue floral as well. Love love love. My last week of maternity leave we went on vacation to the Bahamas. All my normal beach gear was so tight. I decided to treat myself and buy a maxi dress and fun tunic from Lilly Pulitzer so I would have festive things I felt good in while celebrating my last week of time off. Really missing my work skirts. Bit the bullet and bought a pencil skirt from Loft in a fun frond pattern. Because this kid and all her assorted supplies will be getting hauled around with me for the next 18 years or so – I decided to splurge on the fancy pants diaper bags. (Yay for being stylish while cleaning up a diaper blowout!) I bought the small and large sized nylon Marc Jacobs bag in a green color so that it (hopefully) won’t show dirt/wear and will go with both black and brown. (The color is called ‘dirty martini’ – um, awesome!) I use the smaller one for short trips & errands and tuck the small one inside the larger one for being out of the house all day or overnight. Oh! Good tip! The strings do seem flimsy. Thank you!